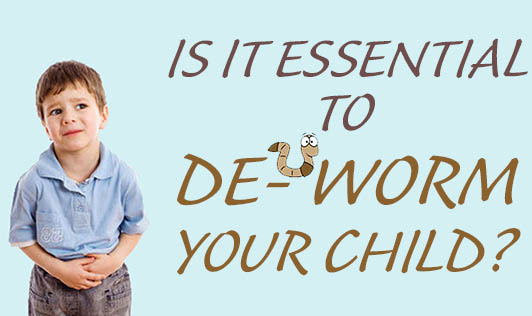 Is it essential to de-worm your child? There are a number of measures being taken to prevent infections caused due to the human parasites viz., hookworm, pinworm, roundworm, tapeworm, and whipworm. Worm infestations often cause serious health problems and impact a child's ability to attend and perform well in school. A UNICEF report says researches have shown that regular de-worming can substantially increase school attendance and significantly improve a child's ability to learn in school. Eventually the growth rate and weight gain of children who are regularly de-wormed is higher than those who aren't. Hence regular de-worming is the best solution for many of the childhood illnesses. How often should we de-worm ourselves and our family? In most cases, de-worming once every six months is sufficient. But, if you suspect/notice that your child is getting worms more frequently, de-worming your child/whole family more frequently as deemed appropriate by your physician may be necessary. Except tapeworms (as in the case of pinworm or whipworm infection), a second dose may be necessary after two weeks or 73-75 days after the first dose to break the life cycle/ to kill the migrating larval forms of these parasites. In any case, de-worming the whole family twice a year is important. But again there are some pediatricians who say that children who grow up in the urban areas do not need de-worming. Only children who run around barefoot on soil infested with animal droppings and those areas with no proper sewage system require being de-wormed. If a child bites his/her nails, is not eating well, is eating too much but not gaining weight, etc., the family elders believe that the child has worms.Parents do not give your child de-worming medicines unless recommended by your doctor. For more accurate information, consult with your physician or pediatrician to know the de-worming interval that should be adopted, the de-worming medicine that should be taken and its dosage needed to keep the parasites at bay. Inform the physician about the allergies and existing diseases/ pregnancy that you have, before your physician charts down the prescription.